“Steven Stayner Missing Children’s Memorial” - Paula Slater, M.A. “Paula, I was just looking at some of the pictures of the Statue the other day (They are hanging on my wall) And was admiring the fine work you have done to make my father a real life size figure. Thank you so much for your dedication and detail you put into this. My brother and I are currently in Afghanistan and still admire the statue from half way around the world. Thank you!" "Paula, Your portrait sculpture of Steven Stayner is exactly how I remember him. You've captured all the details of his face, his hands and the natural gait of his slender body. I can't wait to see the sculpture in bronze at the dedication." In 1972, 7 year old Steven Stayner was kidnapped on his way home from school. For seven years he was held captive by a man who routinely abused him. In 1980, the same man kidnapped another child, 5 year old Timothy White. Steven, then nearly 15, bravely managed to escape with Timothy to a local police station, from which both boys were returned home. Steven devoted much of his time upon returning home to telling his story, teaching parents, children and a whole nation how to protect themselves from what had happened to him. His story is told in the movie “I Know My First Name Is Steven”. In 1989, Steven was killed in a motorcycle accident, leaving behind a wife and two young children. Timothy White became a Los Angeles Sheriff’s deputy, and in 2010 died of a pulmonary embolism, also leaving behind a wife and two young children. Slater was selected from many competing sculptors to sculpt the life size full-figure portraits of Steven Stayner and little Timothy White. She produced a sensitive design sketch of Steven leading Timothy by the hand to safety. She named the sculptural design, “Coming Home” and it was unanimously approved by the committee. 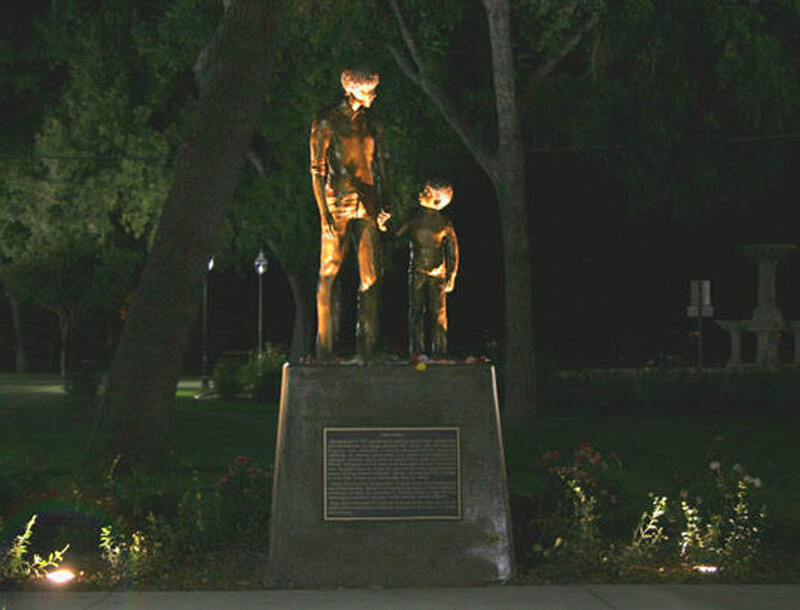 When bronze statues were completed they were installed upon a 4’ high polished concrete base at the entrance to beautiful Applegate Park in Merced, CA. This memorial reminds families and friends of other missing children that their loved one may someday return. It will also recognize other victims of stranger abductions, and will serve as a permanent reminder of our inherent duty to protect our children. Steven in order to hopefully save other children from the same tragic fate. The plaque’s inscription will serve as a wake-up call for all of us to be ever vigilant in protecting our young people from child abduction. The following is a wonderfully written, informative article bY LISA JAMES for the merced Sun-Star Newspaper. 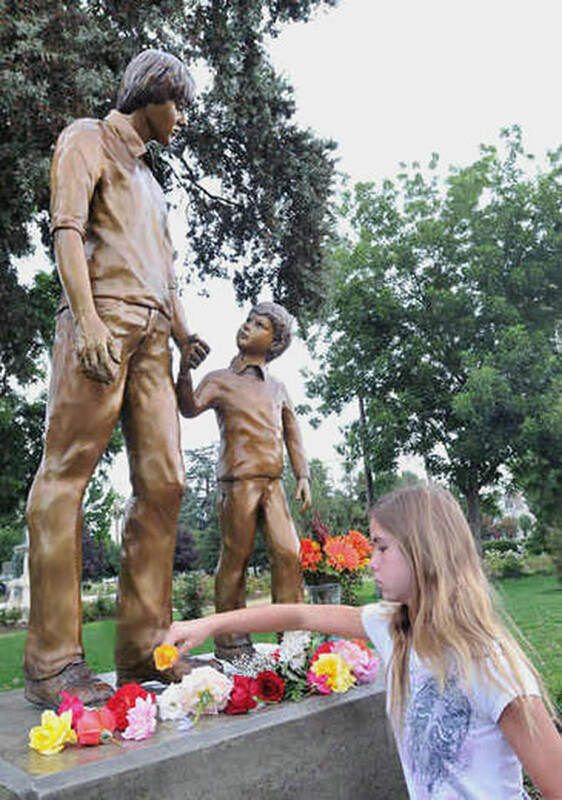 For the families of missing children, a new statue unveiled in Merced’s Applegate Park today, now stands as a beacon of hope, a reminder of survival and heroism in the face of a child’s worst nightmare. 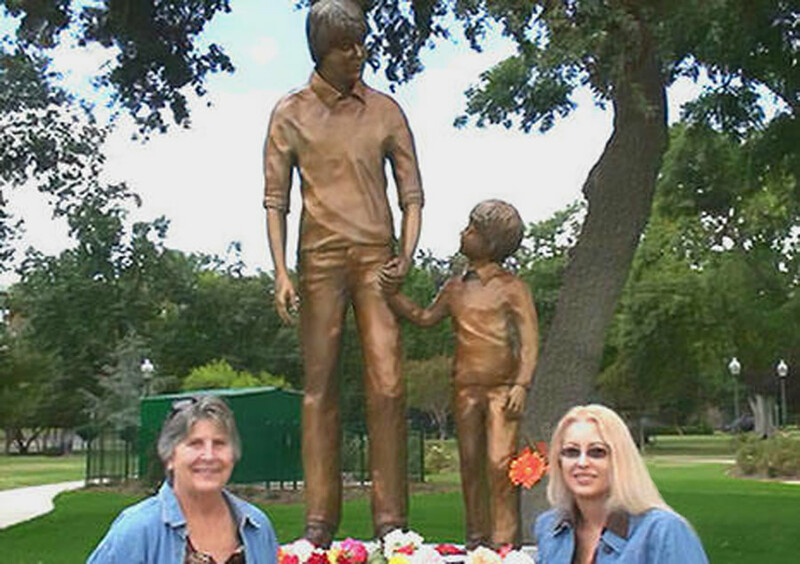 The statue tells the story of Steven Stayner, a Merced youth who was abducted in 1972 and Timothy White, the 5-year-old boy he rescued from suffering the same fate. Steven was kidnapped walking home from school in 1972 by Kenneth Purnell and told his parents no longer wanted him. He spent more than seven years in captivity, routinely abused by Purnell. As Steven reached puberty, Purnell preference for younger boys drove him to abduct 5-year-old Timothy. At that point Stayner decided to save White from the abuse he had endured and the two escaped. Steven returned to Merced to marry and start a family, becoming a champion for the cause of missing children until his untimely death at the age of 24 in 1989. White became a Los Angeles County sheriff’s deputy. White also died an untimely death earlier this year at the age of 35. “I feel divinely guided when I’m inspired by a project and I really felt a presence on this one” said Hidden Valley Lake sculptor Paula Slater of the statue she was commissioned to create for the Steven Stayner and Missing Children’s Memorial in Merced. That statue was revealed in Applegate Park Saturday morning for a crowd of hundreds that included friends and family of Steven Stayner and Timothy White. Many local residents also attended, who never knew the boys but felt moved by the story as it played out in the media across the country. 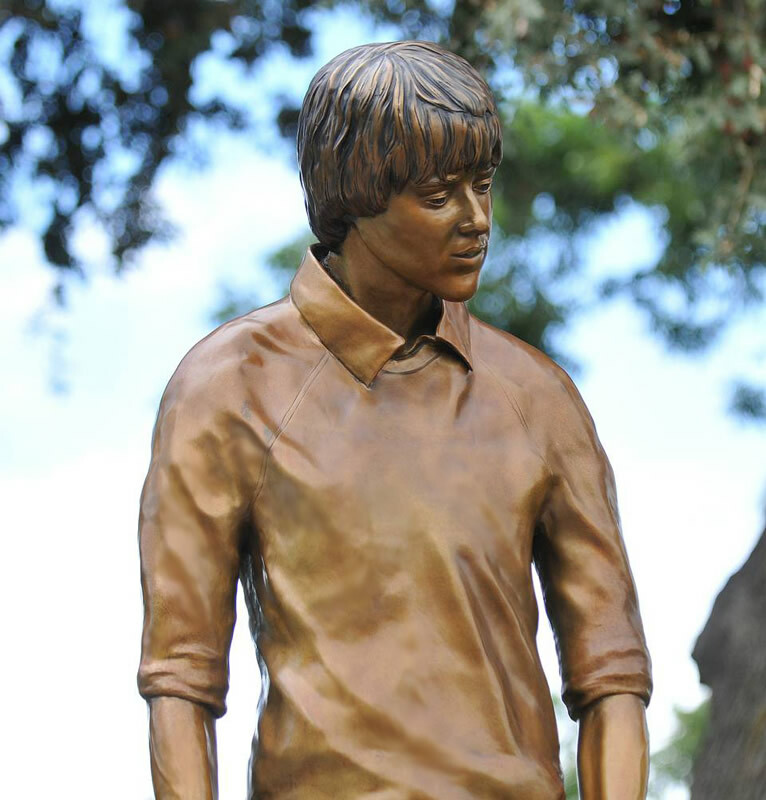 The bronze statue depicts young Timmy looking up at a teenage Steven. Dwarfed by his tall and lanky frame, Timmy takes his hand to set out on the dark road from the remote home where the children were being held. The rest is spine-chilling history, made famous by exhaustive media coverage, books and a film in 1989, “I know my name is Steven”, based on the book of the same name.